What does this business model tell us? Customers are always at the center of any kind of business. The most important and difficult task for a business is to retain existing customers and acquire new customers. And this is possible only by CRM. Read more about – What is CRM and what does it stand for? Here I will tell you 18 importance of CRM software that will make you feel that CRM is super powerful. This is one of the most important benefits of CRM software. Will it be helpful if you can capture customer feedback automatically? Or if any software tells you the next best thing to do based on customer complain or suggestion? Or sends emails, letters and customized gifts to your customers without fail? Using CRM software, you can automate almost any kind of business requirements. CRM helps an organization to streamline business processes. It standardizes and automates sales, marketing and service processes to reduce human error. It tracks all customer interactions like when customer was last contacted, what was the outcome, best fit product based on customer feedback. CRM gives you all information that can turn the lead into customer. Definitely it will improve your Lead To Customer conversion ratio. Customers are more likely to buy personalized products or services than a generic one. CRM helps organization to configure products for each individual. It allows to customize products as per customers’ requirement. Also it considers other factors like zone, country, industry, age group etc. Using CRM, business can define various rules like product compatibility & eligibility, validation, up & cross selling. Sales Cycle is the time that a company takes to close a deal. It starts when a salesperson first contacts with a lead and ends when the lead becomes customer. CRM with sales process automation helps salespersons to track and communicate with all leads. It helps to complete the sales process quickly and efficiently. Customer segmentation (also referred as market segmentation) is an essential business activity in product marketing. It breaks down customer and/or potential customers into smaller groups that share similar kind of characteristics. Segmentation could be based on many factors – buying pattern, geography, age, gender or any other custom rules. This helps business to reach more targeted customers and increase sales. CRM can help you a lot here. It captures and analyzes customer data, coming from various sources. And then it divides customers into groups as per business requirements. It helps organization to develop new product, set product price, run campaign and decide service methods. This is your very first step to reach potential customers with your products. So, it must be flawless. Customer segmentation and campaign management are almost correlated. Customer segmentation finds out the best group to target. And campaign management helps to run campaign and analyze data. CRM leverages the efficiency of marketing campaign by automating the process. A well defined marketing strategy with CRM helps business to get more qualified leads than traditional campaign. CRM reduces the campaign cost, analyzes campaign data and forecasts future marketing strategy. Few years back also, Social Media Marketing was just a buzz word. Now it is difficult for any business to grow without social media presence. Only Facebook has 2 billion active users! Not only marking, social media helps in customer servicing also. Good exposure in social media helps business to reach out more potential customers. It helps to reduce service cost and improve customer engagement. CRM with social media integration helps business to run and track social media campaign, measure its effectiveness, increase sales, resolve customer queries and many more. To know more, read this – Social Media Marketing. Above statistic is enough to show you the importance of good customer service. It helps a business to keep existing customers, bring more business from them and capture new leads. You can automate customer service processes using CRM. It helps to deal with customers’ complaints or suggestions more effectively and quickly. By streamlining the business process, you can minimize human error. CRM gives you better traceability of employees’ actions on customers’ queries. Acquiring a new customer is 6-7 times costlier than retaining an existing customer. Satisfied and loyal customers are more likely to buy products from you than a new customer. Moreover, they spread positive words about your brand. Do you know how word of mouth affects your business? Satisfied customers help to generate more leads and increase sales. CRM helps an organization to increase customer satisfaction and loyalty. You have got the idea that customers’ queries should be resolved ASAP. Very first step is to set proper escalation matrix. It helps to response customers’ queries on time, increase sales, run campaign within budget. CRM is the best place where you can define your own escalation matrix and integrate with customer details. CRM is not only for customer management but also employee management. It is very important to assign and complete tasks within time and budget. You can automate task management process in CRM. It can create and assign tasks among employees based on their skill set, availability, geography etc. Business can set their own rules in CRM to manage tasks efficiently. Not only that, CRM maintains employee hierarchy and control data visibility also. Team leader can assign and track progress of all his team members’ tasks. Manager can see all tasks assigned to team leaders and their subordinates. Many CRM applications offer task synchronization with other platforms as well like Outlook, Google Calendar. Would you like to send a welcome kit to customers once they join with your business? Or an email when their queries are resolved? What about a letter when a new product is lunched? You can specify your own rules in CRM to automate customer communications. This reduces human errors as well as increases customer satisfaction. If a prospect prefers email communication and you send letter, can you ever convert him into customer? Even it will create a wrong impression of your brand. Communication channel matters a lot in every dept – sales, marketing or service. You must capture preferred communication channels of your customers. Also automate the process in CRM so that you reach your customers with their preferred channels only. This will definitely increase lead to customer conversion ratio, sales and profit as well as customer loyalty. Effective team collaboration brings more leads and increases sales. Data from service unit can help marketing department to run more effective campaign or sales department to up-sell or cross sell products. CRM unites various departments (like Sales, Marketing, Service, Management) of an organization. The purpose of collaboration is to enhance the quality of service and customer satisfaction. Data protection must be the highest priority in any business. In CRM, users can see customer data according to their roles and responsibilities. It helps business to safe guard customer information from being stolen or misused. How many customers did you loss last quarter? A CRM application can answer all these questions. It can analyze data, generate reports and measure campaign effectiveness. Even it can tell when a customer tends to leave your business. It also helps upper management to take better decision based on historical data analysis. If you think CRM is costly software and only for big companies, then you are wrong! CRM implementation may be a costly process for SME but over the time it becomes the most cost effective way to run business. Business process automation in CRM saves time, manual activities and other resources. There are many cloud based free CRM software for SME as well. To know more, read Best Cloud Based Free CRM Software For Small And Medium Business. Mobile CRM enables business not to lose a single selling opportunity, even when you are not in office. It helps employees to access customer data using smart phones or tablets any where any time. 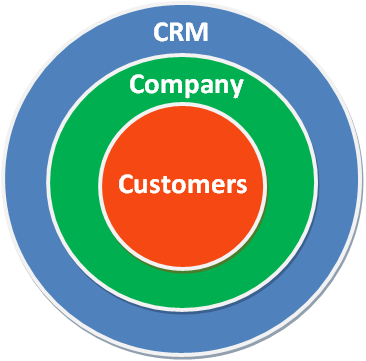 Irrespective of size, CRM enables a company to understand its customer and business well. It provides better insights about customers to improve sales and generate revenue. It is very important to choose the right CRM software for your business. But how to do that? We will discuss this in our next article. Do you have any question about importance of CRM software? Please feel free to comment below. We love to hear you. You’re right. CRM is simply indispensable in any type of business. A business thrives because of one thing – its strong relationship with its clients or customers. It is a good thing that we now have software like SutiCRM to manage these stuff.